André Rieu already has one, but now the city of Maastricht will also receive it's own postage stamp. And there depicted on it again is ... André Rieu!! In the series "Beautiful Netherlands 2010" it is now Arnhem and Maastricht's turn. Last year several cities such as Tilberg, Assen, Deltzij, Oosterhout en Roosendaal were features in this series. Ed Anink from the office of Development incorporated in the Saint Servaas Basilica silhouette, a part of the church's interior as well as the Helpoort (Hell's Gate). And on the bottom of the stamp the Servaas Bridge connects the Basilica with the Saint John's church in addition to a fragment of the Bonefanten Museum. For the attentive viewer, a sculpture in progress can be found behind the court jester's hat, accompanied by violin music by André Rieu. The red cap darts happily across the stamp and the sheet border as a reference to Carnival, sketched by Anink. The stamp will be released on March 29th. 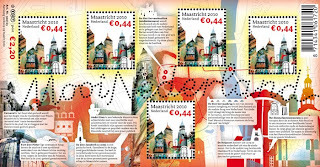 In addition, a sheet consisting of five (identical) stamps will also be made available, surrounded by a text of a walk though the city center of Maastricht. This is all very well, but looking technically at the stamp, André Rieu is bigger than the city of his birth: Last year he received a series of no less then nine different stamps. Maastricht was originally a Roman settlement close to a shallow place in the Maas (Meuse). This place provided an opportunity to build a bridge there so that the main Roman road from Boulogne to Cologne could be led to cross the Maas (Meuse) there. Around 1275 the bridge collapsed after having been in service for more than one thousand years. Shortly there after the bridge was replaced by the still existing St. Servaas Bridge, but built slightly to the north from the original site. It's namesake Saint Servaas, living there from the fourth century, is also the patron saint of the city of Maastricht and the first known bishop in the Netherlands. A wooden chapel was built over his grave, but was later replaced by a stone church. Towards the end of the tenth to early eleventh century, the construction of the current St. Servaas Basilica commenced. Right next to this Roman Catholic Church is the St. John's Church, which has been a Protestant church since 1633 . The oldest city gate in the Netherlands can also be found in Maastricht, and is called the "Helpoort" (hellsgate) and dates from 1229. In addition, the town hall dating back to 1662 can also be admired. It contains a Brabant and a Liège side, in accordance with then two lords governing the city. Today Maastricht is transformed from industrial city to a service city with emphasis on culture and shopping. There are many museums to be found, including the Bonefanten museum dating from 1995, which houses a collection of ancient and contemporary arts. The more than 1,500 national monuments make Maastricht the second monument city of Netherlands, behind Amsterdam. Maastricht's most famous son is undoubtedly the most popular violinist and orchestra leader André Rieu. 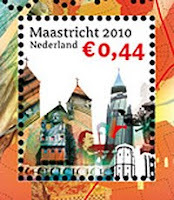 To order the stamps please go to ►Ineke/Ruud's Movies and get the information to purchase stamps from them. Thanks to John for the © copyrighted translation of this article. Thanks Sue for posting We down under are very sad that we ourselves cannot have an Andre stamp here. Not happy Jan. We want our own stamp of the Maestro. From own experiance I know that you can make your own personalised stamps in Australia. See http://pstamps.auspost.com.au/index_wf.html Nothing will stop you of making official Australian stamps with a picture of André. I have already seen personalised stamps of several countries with André on them.